Data generation is essential to gain a comprehensive understanding of the economic, social, demographic, and environmental contexts and dynamics in Africa. In the absence of sound information, entrenched ideas continue to dominate public discourse, which leads to distorted views and inappropriate policies. Perhaps more than anywhere else, knowledge production in Sub-Saharan Africa faces the significant challenge of qualitative and quantitative data availability. Support is needed to produce data at the national level and to produce more targeted studies that aim to clarify local contexts. The issue of the quality of statistical data is neither new nor limited to Sub-Saharan Africa. Shanta Devarajan, Chief Economist of the World Bank's Middle East and North Africa Region and a former board member of the ADF series, denounced what he called “Africa's Statistical Tragedy” in 2011. Morten Jerven refers to the “fiction” of African growth, as he believes we know absolutely nothing about it. Economists and statisticians are highly aware of the weaknesses of Africa’s data-producing institutions as well as the need for considerable human and financial resources. The magnitude of the recent GDP revisions of Ghana, Kenya, and Nigeria has also highlighted the uncertainty over African macroeconomic indicators. Demographics and migration offer an illustrative example: to better understand population movements, to anticipate their changes, and to bolster their impact on economic growth in the regions of outgoing and incoming human migration, the collection, analysis, and dissemination of objective scientific data is the first necessary step. The significant lack of information on geographies of mobility makes collecting and using comparable international data very challenging. The Database on Immigrants in OECD Countries (DIOC) is one such example that helps fuel this process, closing statistical gaps and unraveling otherwise unquestioned ideas about the subject. Furthermore, over the past few years, significant effort has been devoted to improving the quality of statistical data on food production and food prices, especially on cereals, to inform debates on policies to promote food security. Still nascent are measures of consumption and attempts to understand representations, beliefs, and practices associated to food. A study conducted by French Agricultural Research Centre for International Development (CIRAD) and AFRISTAT in collaboration with AFD on the basis of the RuralStruc data collected by the World Bank demonstrated that the domestic market for food is no longer limited to urban areas. The former opposition between cash crop production and subsistence farming no longer makes sense. Closer attention must now be paid to rural markets, both due to their importance as an outlet for farmers and in providing food to consumers. A new World Bank Group report on poverty in Africa provides some insights into the systemic failures behind the lack of good development data in the continent. Insufficient funding and low capacity only partly explain the weakness of poverty statistics in Africa. Prevailing political arrangements often favor less (or less autonomous) funding for statistics. In some countries, donor financing has replaced domestic financing, but the interests of donors are not always aligned with the interests of governments. Solutions to the challenge of raising the stock and quality of household surveys to track poverty include alternative financing models, regional cooperation and peer learning, as well as clearer international standards for poverty measurement. Better data can lead to better decisions and better lives, so this should be a priority in the fight against poverty in Africa. The World Bank Group is working with countries and international partners to ensure that the 78 poorest countries have household-level consumption and expenditure surveys every three years (http://www.worldbank.org/en/news/press-release/2015/10/15/world-bank-new...). Due to a number of situations that are unfavorable to the production of knowledge in developing countries, its practice is still disembodied, conducted from outside, and disconnected from use in public policy. The Global Development Network (GDN) is a public international organization that builds research capacity in development globally and strives to determine the conditions that would increase the quality of research in any given country, through a systematic study of the research environment in developing countries. The ultimate goal is a smooth transition from external knowledge production to intellectual production that is championed and endorsed by policy makers. Accessing external research capabilities can be very useful, even on a temporary and partial basis. Such contributions can only truly be meaningful for development when coupled with support to laboratories and researchers that will maintain a durable presence in the field. Such researchers are already well established and produce quality work yet, due to a lack of international partners and resources, their outreach simply falls below what it should (and could) be. Reinforcing an environment conducive to quality research in countries that need it, and expanding partnerships with research institutions are thus appropriate measures. To bridge research results and the articulation of public policy, it is necessary to have both good quality relevant data and research programs that are firmly anchored in African realities. Research institutions must also act as knowledge brokers. Again, the skills are there. But they need to be adequately supported and drawn upon by policy makers. To achieve the new Sustainable Development Goals, knowledge development and transfer is critical. 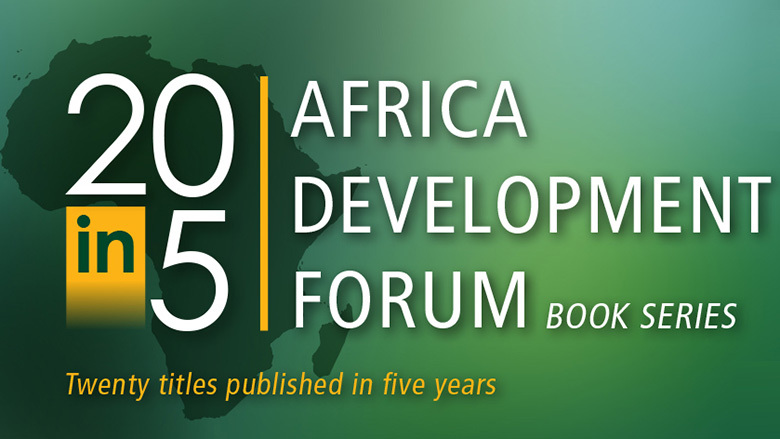 Building on the success of the past five years, the World Bank Group and the Agence Française de Développement will continue to leverage the ADF book series to publish the best quality research on vital issues affecting the continent of Africa. If you are interested in development, visit the ideas for development blog which is coordinated by the Agence Française de Développement.